In celebration of finishing my final exams EVER at university (scary!) my Mum took me to the South of France so we could enjoy some good weather and explore the area. If you've not seen it yet, you can see my one day in Marseilles photo diary here. Other blogs and vlogs about our time in the Camargue where we saw flamingos and semi-wild white horses as well as a gypsy festival are coming up. But first, what I wore while I was there! The usual comfortable get up! 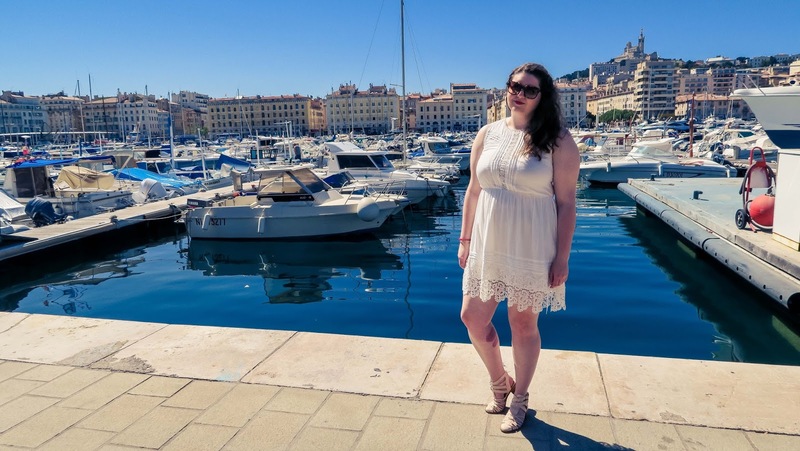 I love this dress so much, plus the sandals are super comfy for walking around the Old Port in Marseille. This was another travel day, so again it's very un-stylish. On Day 3 we visited the Ornithology Park to see SO MANY flamingos (it was amazing), so I was in a very practical outfit- and therefore un-glamorous. We stayed in town on Day 4 to watch the gypsy festival in St Marie de la Mer, so I wore a fun playsuit. Super Casual because we were going on a boaaaat! I LOVE THE DRESS TOO! !